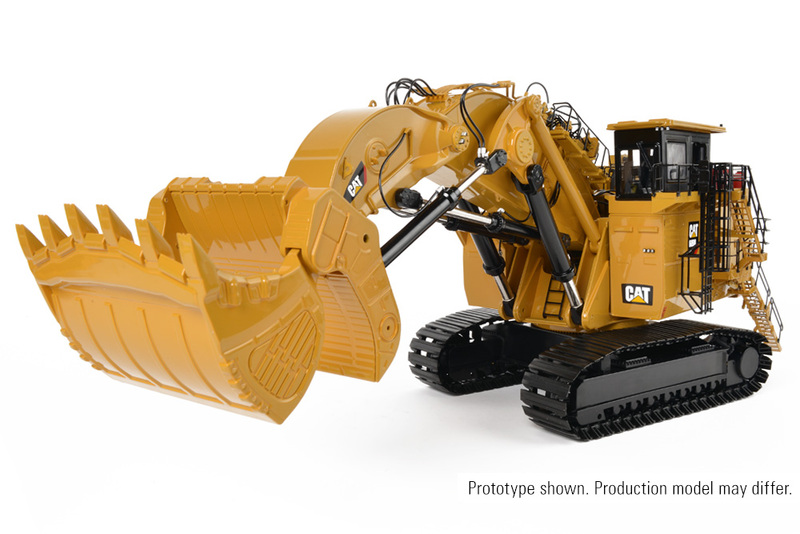 The production sample of our upcoming 1:48 scale Cat® 6090 FS Hydraulic Shovel was recently delivered to our warehouse, and we couldn’t be any more excited about the result. After a thorough review of the model, we had to get it into the photo booth so we could share the progress on this model with all our collectors. The model was then sent to Caterpillar, who, after careful inspection, approved it for production. With production already underway, we hope to have these models available by the end of the 1st quarter of 2018. We will keep you up to date on any news and developments with the 1:48 scale die-cast 6090 FS here. Retail price for the 6090 FS has been set at $690.00 plus shipping and handling, with production limited to 1,090 pieces. This highly-anticipated model has already received more than 1,090 requests, so any additional requests received will need to be added to the backup list. That’s not to say that you shouldn’t still add your name to the request list if you would like a 6090 FS, as there can be some attrition. For those on the request list, an invoice will be emailed to you once the models arrive here at our warehouse. Any outstanding invoices left unpaid after 10 days will forfeit their requested model, and it will be offered to the next collector on the list. As always, models will be shipped in the order in which payment is received, so please don’t delay once you get your invoice! Looks great Gary thanks for sharing. Can I pre order one? but the links of the tracks look different and more distant than the real excavator, why? but the component / mesh Crawler Tracks are distant from each other and have a different appearance from the actual excavator, why? The Model and Detail look Fantastic great work.I hope you Guy’s at CCM are also thinking about producing the CAT 6120B that would be the icing on the Cake. Is there any update on how soon till they ship to the distribution center or when it will be available? Ci sono novità solla data di consegna? The 6090FS is in production now, we will keep you up to date on news and developments on our blog as we know more! Have you received any information on how long till they are ready to leave the factory? Are there any news about arrival of the Cat 6090? $750,000 of orders out there & no updates? you only publish the questions, how can I see the answers ????? Should we all ask for are money back from the dealers that we have prepaid. The reviews you are getting about the models you have actually brought to market are being compared to a company that charges less then 50 and deliver the product. Time to answer some questions. Any kind of update would be appreciated on this. there are a lot of folks eagerly awaiting this grail piece, me included. I wonder if there are unforeseen issues with production which may be hampering the quality of the release. Again-updates of any kind would be appreciated and would demonstrate that CCM cares and is loyal to their consumer base. Nice!! I knew once I said something things would change. Haha cool! I have just cancelled my order because of the poor track link rendering. Pity because the rest of the model is spot on. P.S I already own a Brami TEREX RH340 face shovel and a Conrad Liebherr R9800 which have realistic tracks. Unfortunately, the 6090FS is a closed edition and we no longer have this available for sale. While difficult, it is still possible to find them for sale from dealers or by searching on eBay!